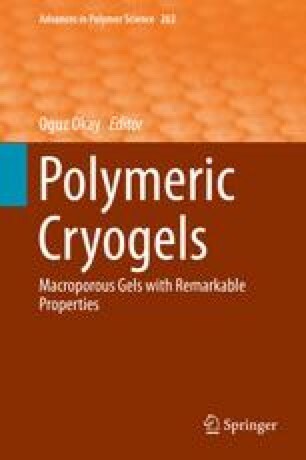 An effective and facile method for the synthesis of chemically crosslinked supermacroporous polymer cryogels based on UV irradiation is reviewed. The influence of key factors like the irradiation dose, temperature of freezing, concentration of polymer or monomer precursor, molar mass of polymer precursor, and the type and amount of the photoinitiator on crosslinking efficiency is discussed. The versatility of the method for preparation of a large number of biocompatible, biodegradable, and/or stimuli-responsive cryogels is demonstrated. Examples include some specific properties of well-investigated polyacrylamide (PAAm) and poly(N-isopropylacrylamide) (PNIPAAm) cryogels obtained by photocrosslinking as well as novel cryogels based on cellulose derivatives, hydrophobically modified polyglycidol (PGL), and ethoxytriethyleneglycol acrylate (ETEGA). Part of this review is focused on the applicability of supermacroporous cryogels as carriers of different species such as drugs, enzymes, nanoparticles, and cells immobilized in either cryogel walls (polymer matrix) or interconnected pores.